At Echeverri Dental Center, we care about our patients’ health and wellbeing. We want all of our patients to have happy, healthy smiles which is why we do our very best to help our patients attain their dream smiles. However, sometimes, even a perfect smile can encounter a dental emergency. A dental emergency requires immediate care and attention. That’s the very nature of an emergency! For our patients, we offer a 24/7 dental emergency hotline: 713-956-8767. We encourage our patients to call this number when they experience a dental emergency. Knocked-Out Tooth: If your tooth has been knocked out, don’t panic! Instead, rinse the tooth off with water, being careful not to touch the tooth roots. Your tooth roots contain sensitive nerves and blood vessels that are crucial to helping replace your tooth. Store the tooth in a safe place, preferably back into its socket. Gently hold it into place with a warm, wet washcloth. If you cannot put it back in its socket, store it in a cold container of milk. Then, call our office to schedule a dental emergency appointment. When you visit the office, bring your tooth with you. We may be able to salvage it. Chipped/Cracked Tooth: First, collect the pieces of the broken tooth and store them in a safe place, as with a knocked-out tooth. Then, call our office to schedule a dental emergency appointment. When you visit our office, bring the pieces of the tooth with you. In the meantime, apply a cold compress to your face to avoid swelling. Damage to Cheek, Gums, Lips, or Tongue: If any of your mouth’s soft tissues have been damaged, call our office to schedule a dental emergency appointment. We can provide treatment to alleviate the pain and discomfort. Persistent Toothache: A persistent toothache may indicate an infected tooth or even an abscessed tooth. 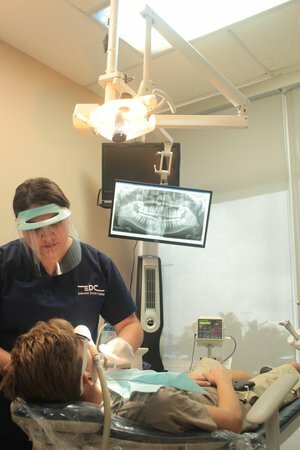 At Echeverri Dental Center, we can diagnose the problem and get you the relief you need with proper treatment. Call today to schedule a dental emergency appointment. A Loose or Lost Dental Restoration: If you experience complications with your dental restoration, give our office a call. We can help fix it or in some cases, replace it. We care about your comfort and health. Call our Houston, TX dentist office when you experience a dental emergency. We will get you the care and attention you need. Contact Echeverri Dental Center today to schedule a dental emergency appointment!